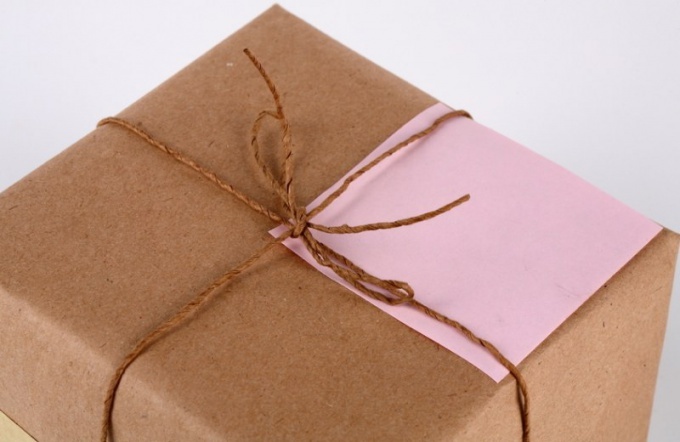 Handing over the parcel at the post for relatives or friends, the sender usually pays for delivery costs. However, for example, an online store may need to send a parcel at the recipient's expense, that is cod. This can be done through the regular post office. Postage for this scheme, first by the sender before the recipient to receive the package returns to him the amount expended. - money to pay for postage. Pack the parcel. For this purpose it is best to buy a box of the right size directly in the post office. On the boxes that they sell, there are fields for the address. But the packaging of the parcel and the house, and the warehouse, unless you are going to do inventory. In the latter case, the package is finally closed at the post office, to postal clerk can verify the conformity of its content provided by you to the list. 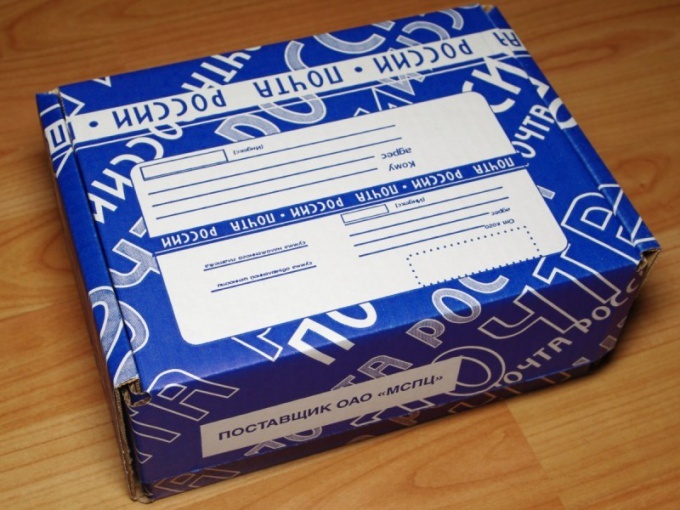 Parcels with postage paid by the recipient it is better to send a list of contents. Complete the appropriate form. It is made in two copies and shall be signed by the operator. One copy put in the package, the second keep. Inventory it is necessary that the recipient was not against you. Carefully seal the package. Calculate the value of the payment. It must be such that the seller, which in this case are you, was not at a loss. The total cost of the postage depends on distance and the amount of cash payment. Necessary advice you can give a postal clerk. For shipment at the recipient's expense ask for a special form. It is in any office. Fill in the required fields. In addition to the usual data for any mail here, you specify another size of cod and the way of making money. You can get them by postal order or Bank account. In the first case, enter your postal address and the second your Bank details. The first option is suitable for individuals. When sending a parcel from the company the money will be needed through the cash register. The second method is universal, to get money to the Bank account can of both legal and physical person. Take the package and mail the completed form to the clerk. Don't forget to get a receipt. Save it before receiving the money. The process of obtaining money for the goods sent by mail payment, almost no different from the usual mail order. You just come in the mail and do the same formalities. - visit to the post office. When you find in your mailbox a notice of receipt in your name, money for cash (seemingly no different from the notification mail), fill it out. You can do this at home. You will need to indicate your name, first name and patronymic, series, number and date of issue and issuing authority. Address information registration filled in only if the one that received the money, different from the one in the passport. During working hours visit the office, which came transfer. Show postal worker passport and a completed notice. When you give money, count it. If everything is correct, sign in the correct place in the notice and date of receipt of funds. If you need to send a parcel or parcel post shipping costs - make it pretty simple. Enough to come to the nearest post office, pack the parcel, fill the form imposed payment and to pay for shipping. Take in the appropriate window (sending and issuing of postal items) the employee of the Department mail the form imposed payment. In the first row (arrow 1) in capital letters enter the amount of the declared value. 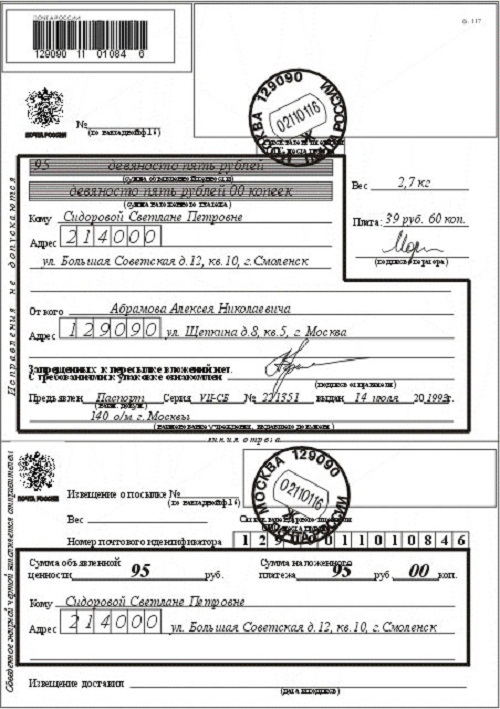 The second line (arrow 2) is also in capital letters - the amount of the imposed payment. In the "to" field (arrow 3)enter last name, first name and patronymic, without reductions, in the genitive case) of the person whom you are sending the parcel. The index and full address (arrows 4 and 5), including Republic, district, city, street, rooms: houses, housing and apartments. For example: the Republic of Komi, Priluzsky district, village of obyachevo, Svobody str., 45. Depending on place of residence, in some cases, it is sufficient to specify only the city, street, house number, room building, apartment, and when sent to a small village - the village name, surname, name and patronymic of the addressee. After filling in data about the recipient, go to the specify of your data. In the string "From" (arrow 6) write your surname, name and patronymic name also in the genitive case. In the next line (arrow 7) specify the index and the address exactly as that appears on your passport on the page "residence permit". The line below the signature, thereby confirming that in the package there is nothing prohibited and that you are familiar with the packing requirements. At the bottom of the formand located in the frame, specify the amount of the declared value and the amount of " cash payment figures, both amounts must be the same. Then re-enter the data "Who": a surname, a name, a patronymic, without reductions, and in the genitive case, the full address and postcode. All other blank fields are filled by an employee of the post office. After receipt of notice on receipt of his name on the parcel, the addressee will have to pay the amount specified in the forme (the amount of " cash payment), in order to get him out of the package. for sending parcels or packages cod you will also need your passport to confirm your identity and accuracy of the data. If you need to buy goods in the online shop, buyers may have fears of becoming a victim of fraud, so many people prefer to pay upon receiving. This method of payment called cash on delivery. Most of the shops of distant trade, trying to attract clients, go to some concessions and agree to sell the goods with payment upon receipt. In this case, they carry some risk and may suffer losses if the client refuses the purchase. The buyer, on the other hand, when making such a purchase would be protected from unscrupulous sellers, so even the most cautious and distrustful people may ordered cash on delivery the goods via Russian post, anything without risking. The contents of the parcel will remain intact until the moment of its receipt by the owner, and postal employees will not be able to determine what it is. Ordering goods can be done on the website of the online store or a regular email form. In the corresponding window, it is necessary to mark that the shipment will be paid upon receipt. 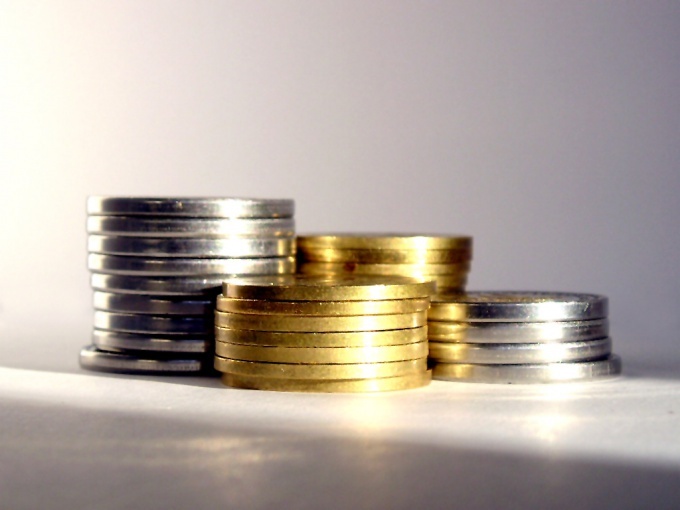 Not to be left at a loss, the firm often includes the cost of such goods a certain percentage to cover the possible return of unclaimed goods. This may be related to the higher price of the goods sent cod. The firm has the right to impose additional restrictions on the categories of goods, the amount of the order, the place of residence of the recipient. As a General rule, the price of cod is usually included the price of the product and the cost of delivery to the addressee, to do cash on delivery via post of Russia is possible only on the territory of the Russian Federation. If the order was made on the website of the online store, its administration informs the client about the order status via SMS. At the time of departure on the website of the Russian post is formed by the identification number of the parcel on which it is possible to track its whereabouts and current status. This will need to go to the official site of Mail of Russia and in the offered field to enter the desired number. Upon arrival of the parcel to the place of delivery to the buyer is notified, which indicates the address of the post office where you want to be with ID. When you receive the parcel need to fill out a receipt and sign the receipt. Payment for goods and delivery are made simultaneously. To protect yourself from marriage, you should open the parcel in presence of the postal worker. If you find a defective product, it is necessary to make a claim, ask the postmaster to put your signature, send a letter to the sender and demand compensation. By law, within 14 days of receipt of the product it can be returned to the seller.